I had interesting experiences during the trip to Fairbanks. 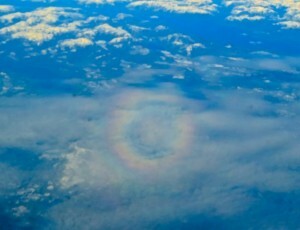 From the airplane and with the sun behind me, I looked down on the clouds below and saw a circular rainbow cast on the wispy clouds. If the clouds were closer to the airplane, I would have seen the shadow of the plane in the center of the circle. This is a nice reward for my hours of looking out of airplane windows when I travel. 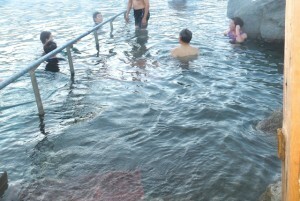 Chena Hot Springs Resort was built to exploit a natural hot spring. This pool of hot 110F (43C) sulfur water steamed in -5F (-20C) air. The resort built a drafty corridor from the changing room to the pool, and walking bare chested in the cold air made dunking in the hot water extremely inviting. The ramp from the corridor to the pool had a bare steel hand rail. Touching it with wet hands would immediately freeze the skin to the cold metal. Fortunately, hot water was readily available for splashing onto the captured hand to free it from the icy lock. 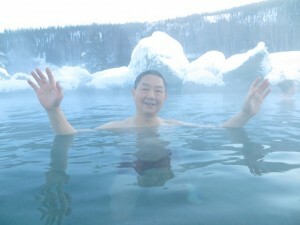 I enjoyed soaking in the hot water while keeping a cool head in the cold air, surrounded by snow covered rocks and mountains in an unusual setting. Steam condensed on hair and then froze in the cold air. Regardless of age, we all became silver haired seniors. 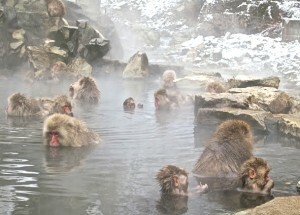 The snow monkeys of Japan share our rare experience. 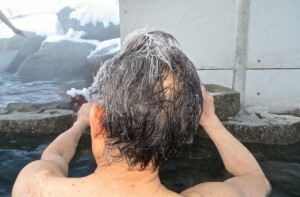 These monkeys learned to leave the snow covered rocks to soak in thermal spring water. 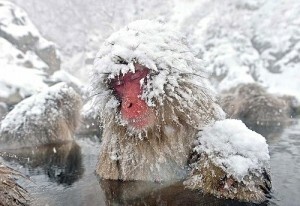 This monkey stayed contentedly in the hot water as snow fell and covered its upper body. I can appreciate the nice feeling. 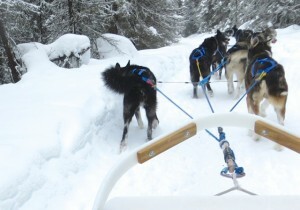 Another experience we cherished was the dog sled ride. The lady owner of the dog sled company lived in this yurt for four years before moving into a house. 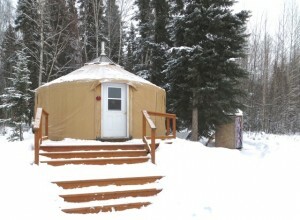 We stayed in this yurt while we waited for our turn at the sleds. The dogs wore elaborate and probably comfortable harnesses. Some dogs seemed happy to be wearing protective booties. 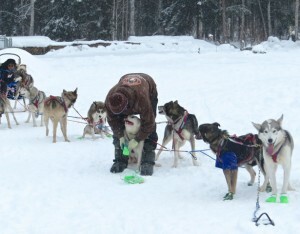 Sled dogs love their jobs. They barked and jumped excitedly in this video. I guess their expectation pumped up their adrenalin and nervous energy. 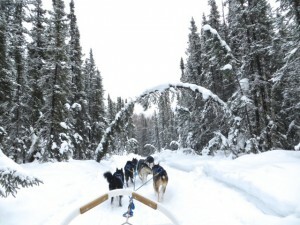 Each sled was pulled by a team of ten strong, medium-sized dogs. Two riders sat in the sled, and the driver stood on runners of the sled. The driver commanded the dogs in a barely audible voice, picked up by the dogs’ sharp hearing. A command of “gee” is for a right turn, and a “haw” is for a left turn. The driver praised the dogs frequently with a soft “good dog” to encourage them. Once released to go, the dogs dashed forward at about 20 mile per hour (32 kph). 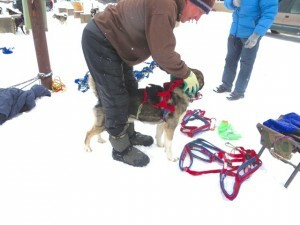 They loved to pull the sled and were eager running dogs. 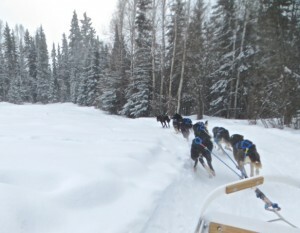 The sled flew forward and bounced on the bumpy ground as shown in this video. I was jolted into emitting audible groans. People with back or spine problems should not ride these sleds. Our rides lasted 30 minutes and travelled some 8 miles (13 km) of public trails. New snow on the trees created a beautiful arctic scene. The camera battery suffered from the 5F (-15C) cold and stopped working after 15 minutes. Once in awhile, a dog would lean over and bite off a chunk of snow. They get thirsty from hard work and quenched themselves with snow. As the dog team was jogging at about 8 mph (13 kph), the last right dog named Blue suddenly got the urge. It was hitched to the team and had to run in a squat to defecate. Then the dog to its left, named Silver, was suddenly infected with the same urge and also ran in a squat to defecated. Sitting in the sled, I broke out laughing at this hilarious scene as Blue and Silver ran squatting and dropping their waste on the trail. My fiend told me later his team of dogs also did the same thing. 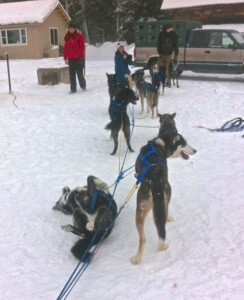 Apparently sled dogs behave in this manner after their body exercised. After the run, the dogs were no longer agitated. Silver rolled on its back as Blue relaxed. Posted by Robert Wu on Wednesday, March 12, 2014, at 5:19 pm. Filed under Uncategorized. Follow any responses to this post with its comments RSS feed. You can post a comment or trackback from your blog.